Your task: to hang the holiday lights outdoors. Unlike Christmas lighters and decorators before, you will resist the urge to be impulsive and buy too many lights, to not follow instructions, install lights during a storm, stand on the very top of a ladder, or lean too far over and look at the lights while balancing on your sloping roof. If this is your first time, keep it simple. You can always add to your holiday light collection each year, adding more rows, outlining architectural features, or wrapping lights around trees and branches That way, you get a feel for what works, what doesn't, what you like and what you don't. By the way,​ do you know the safe way to use a ladder? View your home from the perspective of a passerby or driver, because it is from their vantage points that others will be viewing your holiday decorations and lights. Unless you dress up as an elf, hire the local high school glee club to perform and hand out free cocoa, people probably won't be leaving their cars to interact with your holiday lights and yard display. Stepping back and looking at your house will allow you to view it in its entirety—house, yard, porch, etc., along with rooflines, windows and other architectural details that you might want to outline in lights. Taking a photo will enable you to make a rough sketch of where you want to hang your Christmas lights and display holiday decorations and yard props. For experienced, diehard holiday lighting enthusiasts (introduced via the Griswold family in National Lampoon's Christmas Vacation and perpetuated in every other holiday movie since then), holiday lighting computer programs like Light-O-Rama are available to design displays and synchronize lights and music. But first, you need to learn the basics of hanging holiday lights. Seriously—that thing about safety? Every local newspaper has a story in its archives about a home lighter who fell while hanging Christmas lights. Just because you're doing something you may consider neighborly, festive or even sacred doesn't mean that a higher being will protect you during the process. That said, it's time to gather supplies and tools to hang outdoor Christmas lights and make the job quick and safe. With a trusty retractable tape measure in hand, estimate the width or height of the area on which you wish to hang light strands. Make notations on the photo printout of your house, so you'll know how many feet of light strands are needed for each section. When starting out, it's best to hang lights on one area of your house, like the roofline, or outlining the front door or windows. Add a section each year, rather than all in one season. If you'd like to avoid an extra trip up the ladder and if your roofline is flat, another way of estimating the width or length of the area you want to hang lights is to measure the width of the house at the bottom. While not precise down to the exact inch, it gives you better than a rough idea of how many feet of light strands are needed. When buying light strands, look for a box marked for "indoor/outdoor use." Why? They are made to withstand the elements. You don't want the more-fragile indoor tree lights decorating something outside, only to have it stop working in a week or two. Also, use lights that are UL listed (Underwriters Laboratories). While unpacking light strands, look for any broken or missing bulbs. Also, check the cord for worn or cut wiring. Disentangle light strands and cords. Plug in the strand to an electrical outlet to make sure all the lights are working. Many strands come with replacement bulbs if you keep them in a place where you can find them. The older incandescent light strands are more likely to all stop working if one or two lights burn out. LED lights, on the other hand, do not tend to have the same problem and also last longer and are more energy efficient. Remember: Do not mix LEDs with incandescent strands on the same circuit. In his book, Holiday Hero: A Man's Manual for Holiday Lighting, author/lighting designer Brad Finkle has nothing but praise for plastic light clips. "Whoever invented plastic light clips needs their own shrine in the Holiday Hero Hall of Fame," he writes. "Thankfully, these devices replaced the old hammer-and-nail-on-the-roofline technique several years ago. They can, quite frankly, take hours off your installation and takedown time." While the traditional method of installing holiday lights was to use nails or to attach cords with a staple gun, try to avoid doing it this way, even if your father, grandfather or Mr. DIY Handyman neighbor insists that's the only way to hang lights. Plastic light clips make the job so much easier. Oh—and the manual is for men and women alike—don't be discouraged by that title! While you're up on the roof or ladder, try to work from the top on down. Also, hang holiday lights when it's still light outside. Roofs, ladders, and darkness are not a safe mix. Clamp plastic clip onto rain gutter, eaves, siding or railing to hang light strands. These flexible plastic clips can hold any type of light strand, including icicles and the larger C7 and C9 bulbs. Because they aren't hard plastic, these all-in-one plastic light clips should hold up for a few years or so. Because LED light strands come with a foot or so of excess unlit wire, loosely roll up and clip this extra cord into one of the unused portions of the clip. Then roll the wire so that the light spacing is even. Space it according to the number of lights; for instance, for every four or so bulbs you would attach it to a light clip. Clips also work on eaves. The clips are quite versatile. See that roof gutter with the leaves and debris? While not worthy of Santa's Clogged and Dirty Roof Gutter List, it could definitely be cleaned out, along with the downspouts—preferably before the lights are attached. This should be done before attaching the lights. The flexible plastic light clips can be used for rooflines, siding, decks and rain gutters. Plastic holiday clips can be found at hardware or big-box stores. To continue the job, snap light clips onto gutter or eaves every 6-10 inches so that lights don't swag or droop. 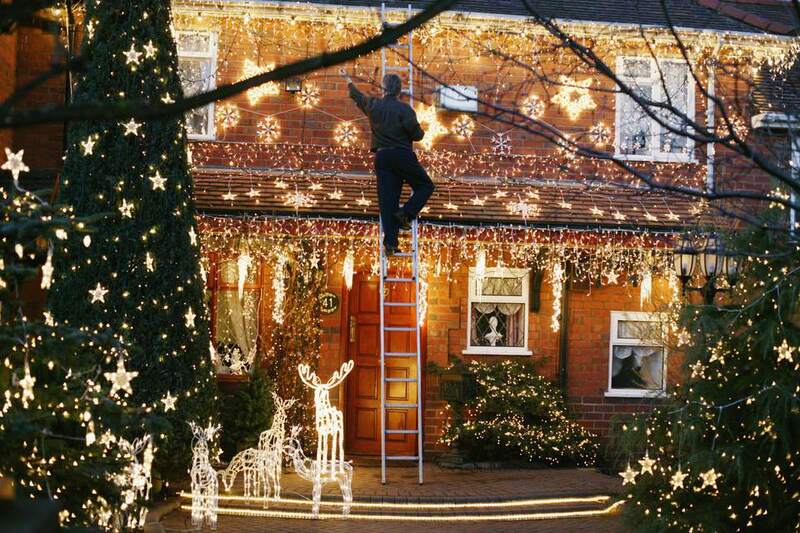 If you measured accurately, you should have enough lights (or a little extra) to span the width of your roofline. The excess can be attached around the corner of the eave or roofline. For attaching light strings to areas like balconies or porch railings, plastic zip ties also work well. Zip ties are strong, weather resistant, adjustable and easy to remove. After strands have been installed, plug the male end of the last strand into an extension cord. Then plug the extension cord into an outdoor outlet preferably controlled by an on/off switch, automatic timer, or app. Switch on or plug-in, and you've got holiday lights! If you use LEDs, like these colored icicle lights, you will be saving energy and cutting down on your electrical bill. You've got your basics this year—next year you can add a timer, wire-frame yard sculptures, inflatables, retro lighted blow-mold figures, net lights for shrubs, rope lights for tree trunks and win the "Most Spectacular Light Display" award for your neighborhood. But for now, enjoy the simple pleasures of the season.